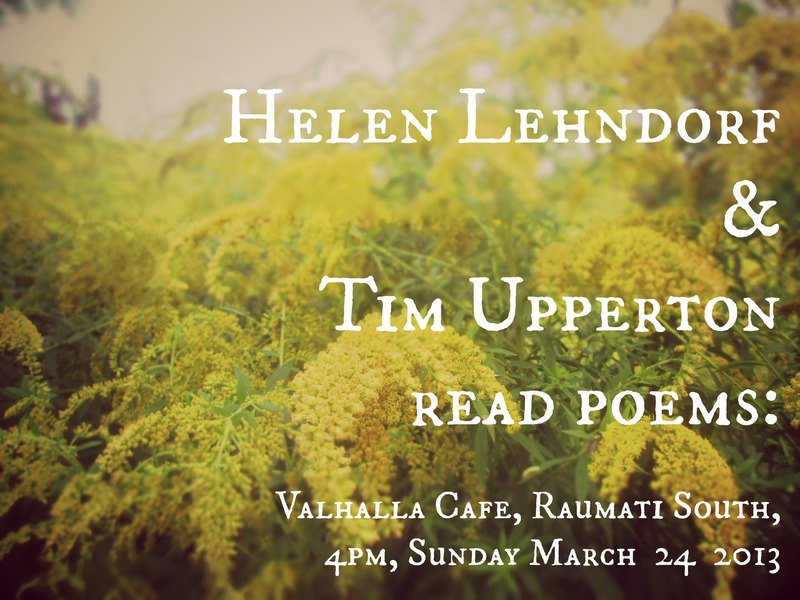 Of course I am just being silly – Valhalla is the name of a cafe in Raumati South which has a monthly poetry reading. I am reading with fellow Palmerston North poet Tim Upperton. I went to hear Bill Manhire at this poetry night when the cafe was called ‘Lembas’ and it was a top notch night out. I am always delighted to be invited to read, then I spend quite a bit of time getting very nervous and worked up about reading, then afterwards I am happy that I did it. If only I could skip step two of this pattern. Hey I might try and make it to Raumati you hear/see you read. Oh no, not a pub! I hate pubs. Ah well, I will work on my pub-phobia before Sunday. Yay,! That you are gonna come! just found out visitors are arriving at 4pm, i’m sorry to miss it!